The Quonset Point Airshow afforded NYCAviation.com with an incredible opportunity to spend some time behind the scenes with the U.S. Navy Tactical Demonstration (TACDEMO) team. Being up close and personal with the Navy’s frontline strike fighter and surrounded by the incredibly talented and dedicated team behind the demonstration was a unique privilege that showed just how much work goes on away from the public eyes to support 12 minutes of speed and power. MacGruber climbing away from show center. 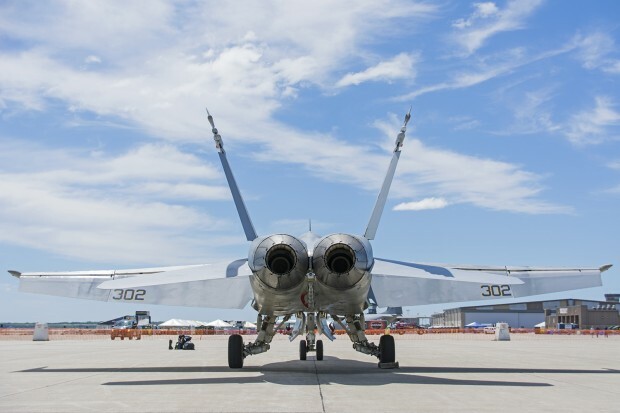 The TACDEMO teams are tasked with demonstrating the capabilities of the F/A-18 Hornet to the public at airshows throughout the country. 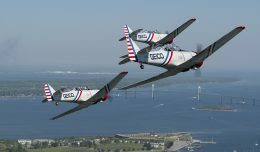 The team for the Quonset Point show consisted of five members, one demonstration pilot, a safety pilot/observer, and three ground crew members. 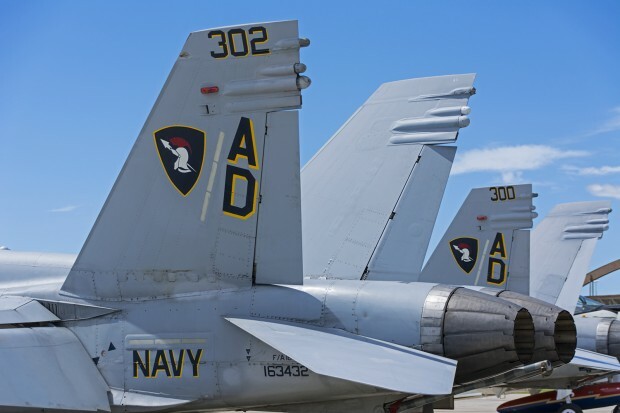 The team members are all assigned to the east coast Hornet fleet replacement squadron, VFA-106, the Gladiators, out of NAS Oceana. 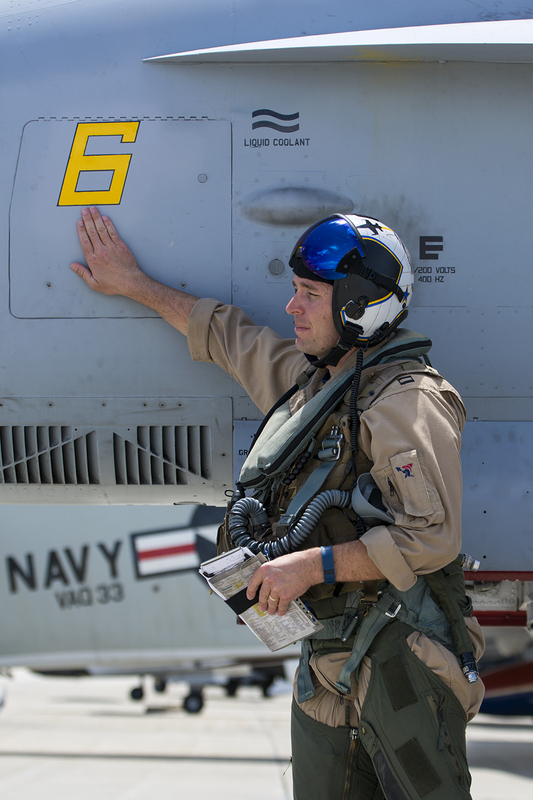 When they’re not out showing off the capabilities of the Hornet, the pilots serve as instructors to up and coming Hornet drivers, and the ground crews keep the aircraft ready to fly. There are four TACDEMO teams who share the responsibilities of flying about 45 shows a year. 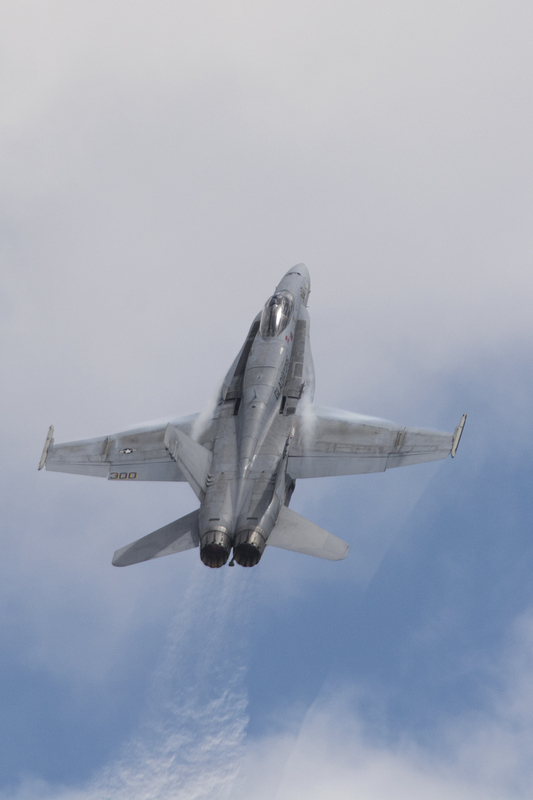 The two East Coast teams fly out of VFA-106 and showcase the C model “Legacy” Hornet, and the F model Super Hornet. 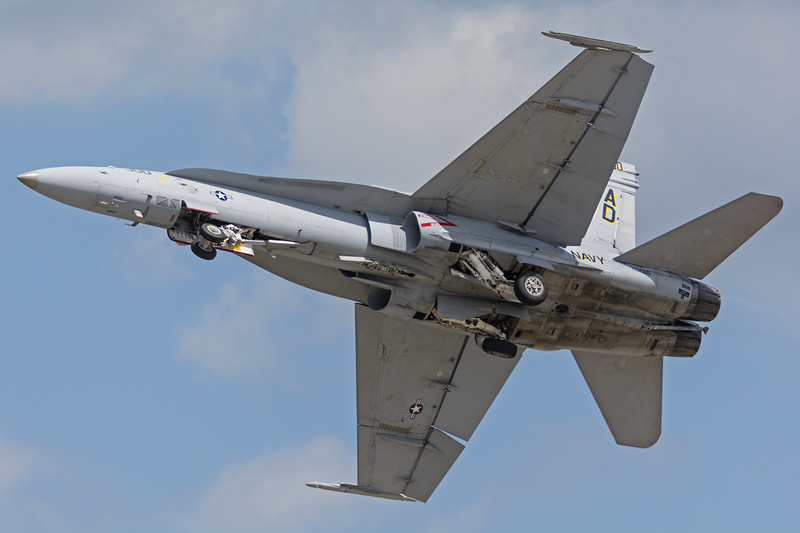 The West Coast teams fly out of VFA-122, and showcase the E and F model Super Hornets. 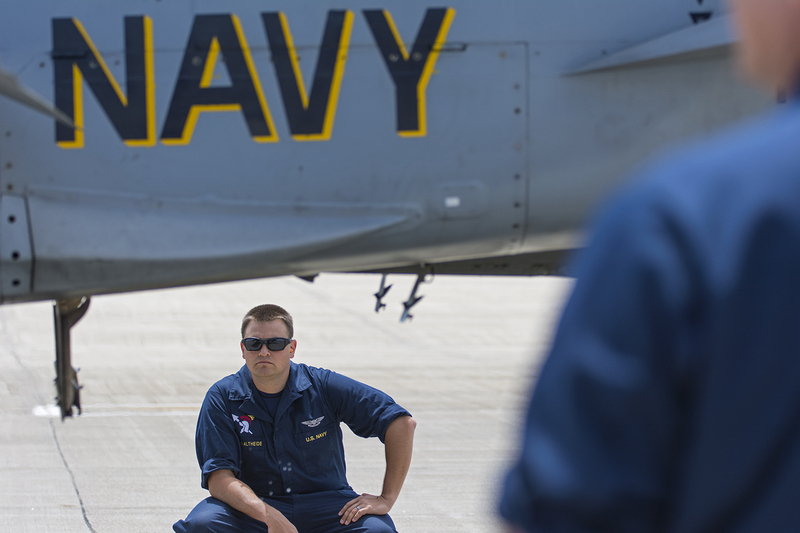 Each squadron has 4-6 crews split among the two airframes who are all qualified to fly the demonstration. 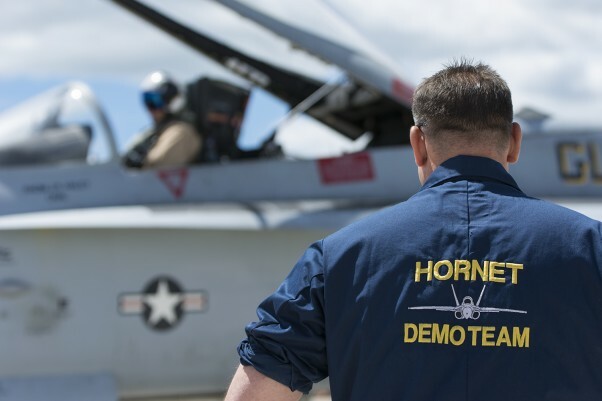 To be considered for the team, aircrew are required to be based at VFA-106/122 and have a minimum of 750 hours in the Hornet, which translates into at least six years of experience including time in the fleet. Pilots generally spend one year with the team, though some remain for multiple years to help maintain continuity and provide training to incoming aircrews. Prior to flying any demonstrations, pilots are required to fly a minimum of 12 practice shows in a simulator, as well as nine practice shows in the actual aircraft before being approved to fly in actual airshows. On the maintenance side of things, each team has two crews of maintainers, with three to four traveling to each show site. A show crew consists of one chief and two or three petty officers, all of whom typically stay with the team for two show seasons. MacGruber and Bearshark briefing the maneuvers. For the team, the show day starts with the morning performer briefing at the show site. Prior to the pilots coming out to the aircraft, the ground crew gives both planes a preflight inspection and prepares them for flight. 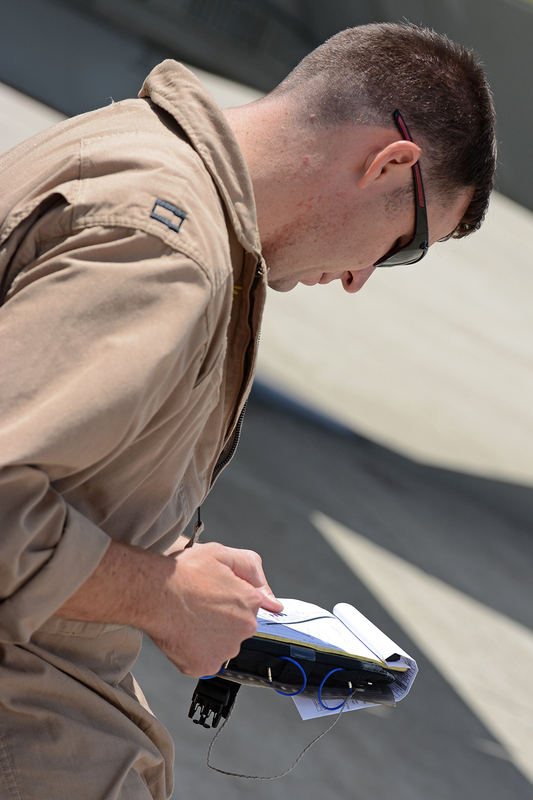 It is often said that the aircraft belong to the ground crews, and they simply let the pilots borrow them, and this was evident with the TACDEMO team. There was a clear sense of pride among the crew as they got the jets ready for the demonstration, in this case numbers 300 and 302, both sporting full color paint schemes. With the difficult fiscal situation for the military, and the years of heavy use in service, the dedication of the ground crews is a critical part of ensuring the TACDEMO goes off without a hitch. 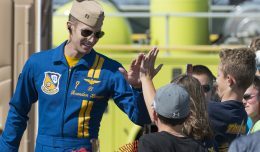 Both aircraft had the Blue Angel 6 painted on the nose as a tribute to Capt. Jeff “Kooch” Kuss, who perished in a crash on June 2nd during a practice demonstration in Tennessee. 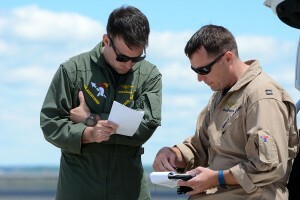 About 40 minutes prior to takeoff, the demonstration pilot and safety pilot arrive planeside. After a quick talk with the ground crews, the entire show routine from start up and takeoff through the landing and taxi back to the chocks is briefed in detail including parameters for each maneuver, radio frequencies, and weather among other things. Utilizing an airport diagram, the pilots ran through the demonstration in traditional pilot fashion, with one’s hands taking place of the aircraft. Any specific challenges or difficulties at a given show site are discussed, as is anything that may have come up in prior demos. 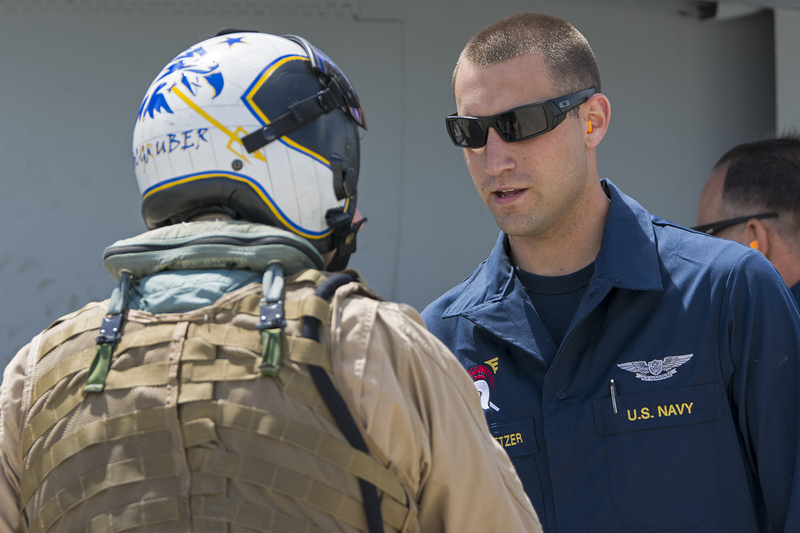 The level of detail makes it clear how seriously safety and proper procedure are to this team and the Naval Aviation community as a whole. 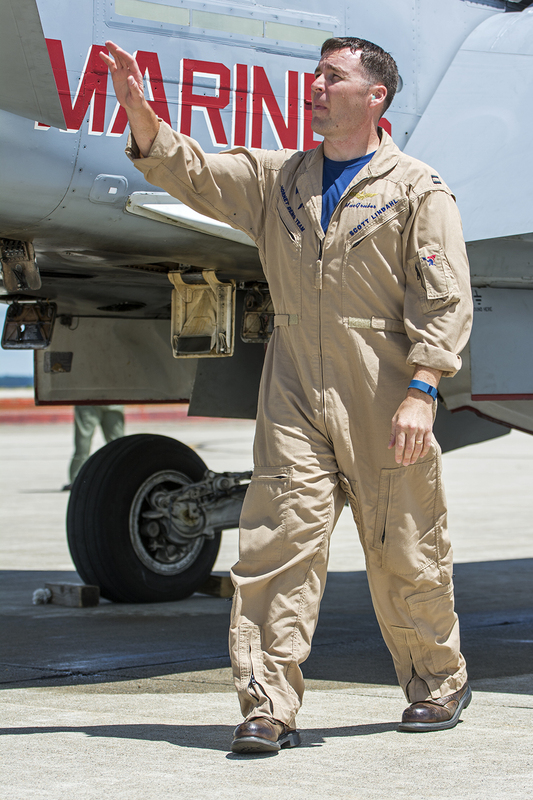 Prior to climbing into the jet, Lt. Scott “MacGruber” Lindahl, the pilot for this weekend’s demonstrations, performed a thorough preflight, taking a lap around the aircraft to ensure everything was in good working order and all panels were closed and secured. Following the preflight, MacGruber pulled on his flight gear under the watchful eye of the ground crew. 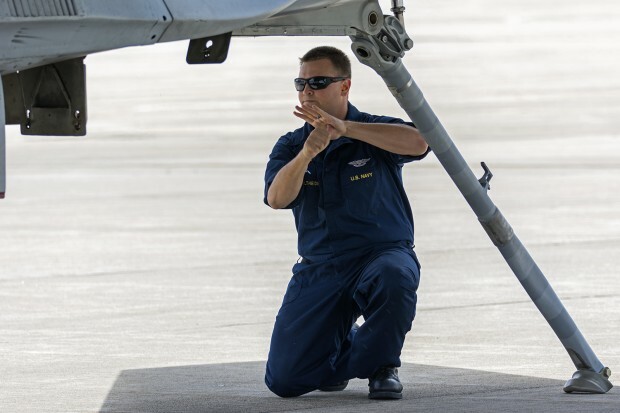 Before climbing in the jet, Lt. Lindahl made a point to touch the 6 painted on the nose of the jet as a sign of respect to the fallen Blue Angel. The air was soon filled with the sound of the Hornet’s twin GE F404 turbines. With the systems up and running, the plane captain had Lt. Lindahl test out the jet’s systems, running the flight controls through their full range and ensuring the critical systems were good to go for the flight. 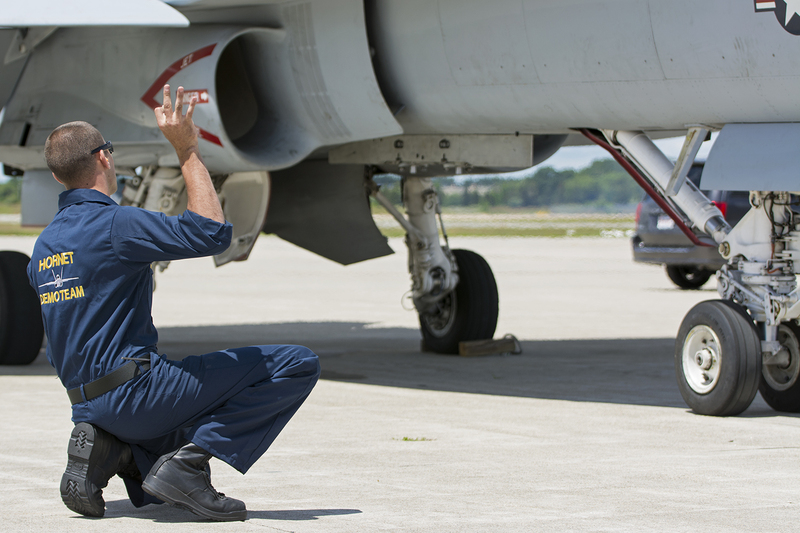 The ground crew kept a careful eye on every part of the aircraft during the startup and check sequence, signaling to MacGruber to actuate each control surface or system. At this point, I joined the safety pilot and observer Lt. Nick “Bearshark” Green to run over to show center to watch the demonstration. 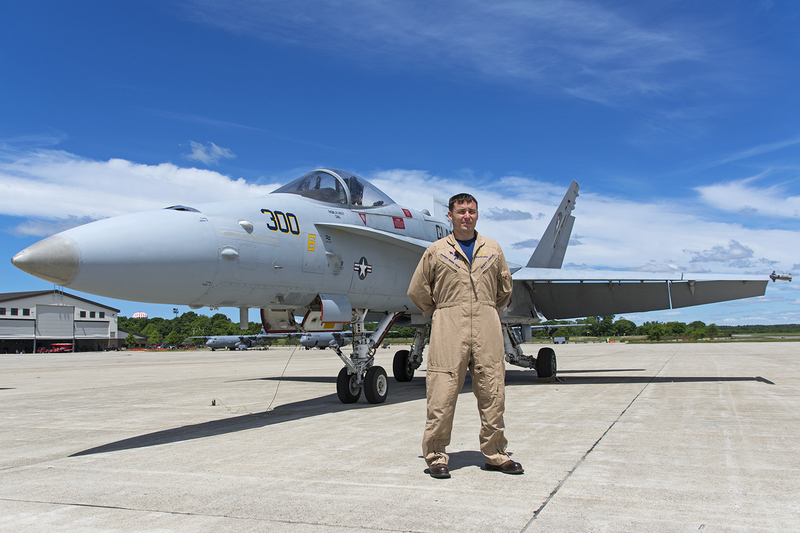 Following a brief wait while MacGruber taxied to the end of the runway, the air boss cleared him for takeoff, and the F/A-18C began rolling down the runway. The lightly loaded Hornet was in the air after a short roll, and Lt. Lindahl retracted the landing gear and stayed low in afterburner, accelerating until he reached the end of the runway for a pull up. 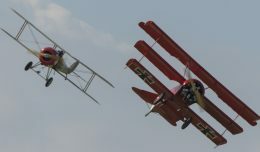 As the aircraft cleared the showline, the narrator informed the crowd of the recent loss of “Kooch”, setting Lt. Lindahl up for a dedication pass. In contrast with the normal photo pass, this dedication pass was flown with the engines at a low power setting until reaching the end of the maneuver. The relatively quiet pass combined with the 6 visible on the nose was a fitting tribute to Capt. Kuss. A display of raw power from the TACDEMO Hornet. 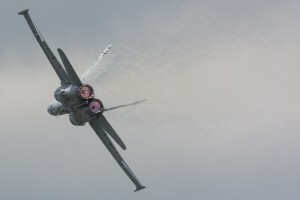 For the following 12 minutes, MacGruber put the F/A-18 through its paces with a series of maneuvers replicating situations the Hornet has to go through in regular operations. From speeds just under Mach 1, to a high alpha pass less than 100 knots over the ground, the flight envelope of the jet was demonstrated in stunning fashion. Minimum radius turns, pitch authority demonstrations, carrier configuration passes, and a beautiful touch and go were among the maneuvers performed during the high energy demonstration, with a final high speed photo pass being the exclamation point on an amazing flight. 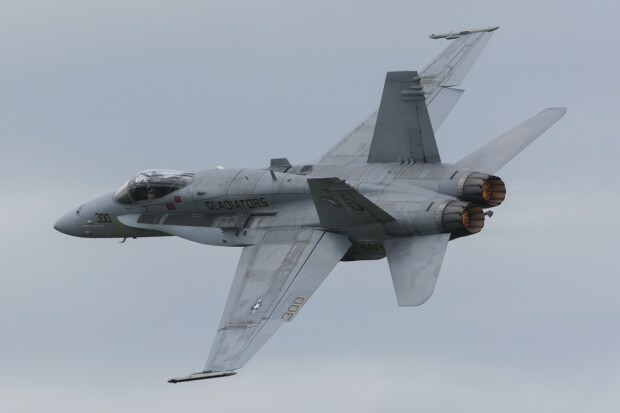 Following an overhead break to land, Lt. Lindahl brought the F/A-18 back to earth and taxied back to parking right in front of the crowd wearing an ear to ear grin and waving to the fans. The pride and efficiency of the ground crew was once again on display as they performed postflight checks on the aircraft. With no major maintenance issues coming up, the jets were refueled and buttoned up for the night. It was an immense privilege to witness the skill and professionalism of a military single ship demonstration team up close, and an even bigger one to photograph it to share with people who may otherwise never have the chance to see it. 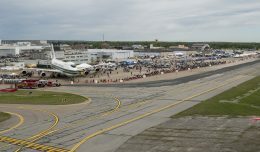 I would like to take the opportunity to thank the Rhode Island Airshow public affairs team for allowing me to cover the show, as well as the members of the East Coast Legacy Hornet TACDEMO Team for their hospitality and friendliness. To Lt. Scott “MacGruber Lindahl, Lt. Nick “Bearshark” Green, AMC (AW) Girouard, AE1 (AW) Altheide, and AM2 (AW) Metzer, thank you for putting up with an enthusiastic aviation photographer who has a special place in his heart for the Hornet. More photos from the F/A-18 demonstration follow below. Gladiator Hornets 300 and 302 ready to go. AM2 Metzer talking with MacGruber before the demo. The tail end of the dedication pass. 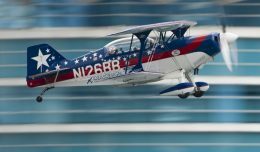 Mark is a lifelong aviation and photography enthusiast based in Michigan and has been writing for NYCAviation since 2015. When he's not traveling to airshows and races, he can often be found out on the lake in the summer, and on the ice as a hockey referee in the winter. He's always up for a plane ride, even if there's a strong chance of G-LOC or revisiting breakfast! His favorite airports to spot at are JFK, EGE, and of course TNCM!